Safinamide Mesylate is mesylate salt of Safinamide, selectively and reversibly inhibits MAO-B with IC50 of 98 nM, exhibits 5918-fold selectivity against MAO-A. Phase 3. Tranylcypromine is a monoamine oxidase inhibitor, which inhibits CYP2A6 with Ki of 0.08 μM and 0.2 μM in cDNA-expressing microsomes and Human Liver Microsomes, respectively. Moclobemide is a MAO-A (5-HT) inhibitor with IC50 of 6.1 μM. Inguinal adipose stromal cells were differentiated into adipocytes, treated with various chemical inhibitors (1 μM) with or without harmine (1 μM) for 24 h, and then harvested for qPCR and western blot analysis (n = 6 wells/group). Quantitative PCR analysis of Ucp1 expression in the adipocytes treated with harmine and (a) DYRK1A inhibitor, (b) MAO-A inhibitor. Data represent mean ± SEM. *p < 0.05. Iproniazid is a non-selective, irreversible monoamine oxidase (MAO) inhibitor (MAOI) that is used as an antidepressive agent. Rasagiline is a novel selective and irreversible MAO-B propargylamine inhibitor with in vitro IC50s of 4.43 nM and 412 nM for MAO-B and MAO-A, respectively. Tranylcypromine is an irreversible inhibitor of monoamine oxidase (MAO) with a rapid onset of activity. Minaprine dihydrochloride is hydrochloride salt form of Minaprine, which acts as a reversible inhibitor of MAO-A in rats and weakly inhibit acetylcholinesterase in rat brain (striatum) homogenates. Safinamide is an orally active, selective, reversible monoamine oxidase-B inhibitor with both dopaminergic and non-dopaminergic (glutamatergic) properties. The IC50 value of safinamide for MAO-B is 98 nM. Pargyline is an irreversible inhibitor of monoamine oxidase (MAO)-B with Ki values of 13 and 0.5 μM for time-dependent inhibition of the activity of MAO-A and -B, respectivey. Paeonol (Peonol), a phenolic compound extracted from Chinese herbs Paeonia suffruticosa (moutan cortex) and Cynanchum paniculatum, inhibits MAO with an IC50 of about 50 μM. 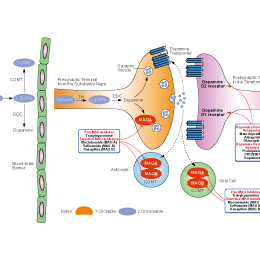 Isatin is an endogenous MAO inhibitor with an IC50 of 15 μM and more active against MAO-B than MAO-A.